IPets PET618 has all the features a professional trainer or serious amateur needs and more! It's rugged, waterproof, rechargeable and affordable! This e-collar can handle any terrain you decide to trek through, be it a park or the wetlands. 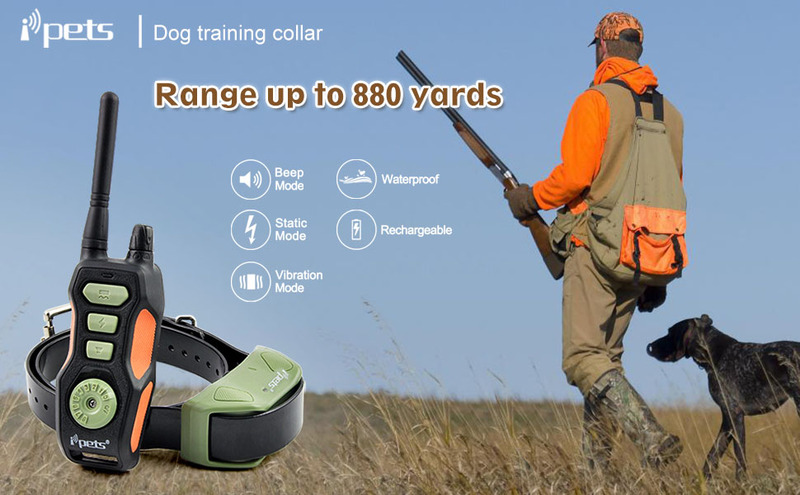 It contains advanced long range technology to accommodate the user up to a 1/2 mile, which is beneficial for users who need more range for a large yard, working or sporting dog. Swapping between functions is simple, quick and effective with our remote transmitter layout. Our device is highly accurate, providing a broad range of stimulation for the static shock and vibration features, ensuring the user will find a stimulation that best suits them. Lastly, this dog training collar is expandable up to three dogs to one remote transmitter. My dog has very long thick fur. Are the pins long enough to make contact? are there two sets of pins? Long and short? Yes, we include three sets of contact points (pins) to accomodate any length of dog hair. Does the IPets PET618 E-Collar have a bark control setting on it ? I would like a collar that has bark control and also be a training collar. Will the collar go into \"sleep\" mode? As in, if the dog is not moving will the collar need to be shook to \"wake up\"? No, this collar does not have this feature.